Q. What is the Hawaii Boater Education Card? A. The Hawaii Boater Education Card (also known as the Hawaii Boating License or boaters license) is proof that you have taken and passed a boating safety course approved by the Hawaii Division of Boating and Ocean Recreation. 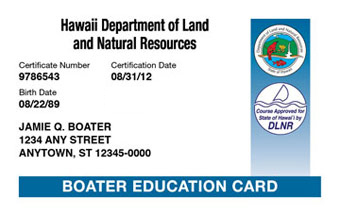 All Personal Watercraft or 'Thrill Craft' operators are required to have a Boater Education Card while operating in Hawaii. The Hawaii Boater Education Card is good for life and does not need to be renewed. A.The boater education card is proof that you have successfully completed a boating safety course. The card does not expire and does not need to be renewed. Therefore, it is NOT an Hawaii Boating License although that's what most people call it since they are used to the term. Q. I do not have a driver's license. Can I still get the Hawaii Boater Education Card? Q. How do I get my Hawaii Boater Education Card? Q. Who needs a Hawaii boater education card? A.As of November 10th, 2014, anyone who wishes to operate a motorized boat over 10 horsepower or a PWC is required to obtain a Boater Education Card. For more information please consult the Hawaii boating laws and regulations page. A. There is a one-time fee of $29.95 paid to BOATERexam.com®. BOATERexam.com® also offers some tips and tricks on passing the boating license test for those who wish to further prepare for their exam. Q. Is anyone exempt from obtaining the Hawaii Boater License? A. Yes, there are certain exemptions from the boat safety education requirement. For more information, check out the Hawaii Boating Laws page.